Jessica is an Urban Planner specializing in the field of public transportation planning. She has worked for Vlecides-Schroeder Associates, a Chicago planning firm, since 2006. She received her Masters of Public Administration in 2006 from the University of Illinois at Chicago. Jessica has been an avid gardener for several years, and became a University of Illinois Master Gardener in 2008. She is particularly interested in growing edible plants, and during Chicago's wonderful but often too brief summers she grows the majority of her household’s vegetable supply. In 2010 she decided to take vegetable gardening a step further and began growing produce for sale at the Logan Square Farmer's Market. She also started her own garden design and management company and currently manages a 900+ square foot raised bed restaurant garden in downtown Chicago. With her friend and co-founder, Gina Thomas, Jessica founded Forest Park Community Garden in 2009, motivated by her own passion for growing food and a desire to share that passion with others. She believes that a lack of garden space, knowledge, or confidence should not stop any person from gardening. Gina is the Supervisor of Transplant IT at Northwestern Memorial Hospital where she has been employed since 2002. Her professional experience includes policy and procedure development, project management, process improvement and staff management. Gina holds a Bachelor of Science in Organizational Behavior from Northwestern University and an Associate of Applied Science in Medical Technology from Southwest Tennessee Community College. Gina has been gardening since the summer of 2007 when she decided to grow an organic tomato. Today most of the yard of her small house has been replaced by vegetable and perennial gardens. While she still considers herself a novice gardener killing the occasional plant, she also grows and builds some cool stuff. Her greatest gardening accomplishments are the cedar pergola built over a weekend with good friends, raised vegetable beds she constructed herself and the trip to Las Vegas she won in a tastiest tomato contest with a Cherokee Purple tomato she grew from a plant purchased at Jewel grocery. 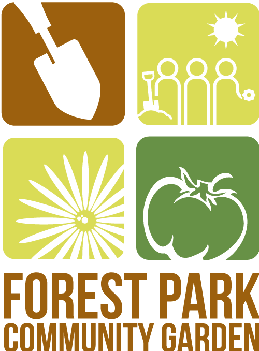 In 2009 Gina partnered with her friend Jessica Rinks to start Forest Park Community Garden believing that everyone in her community who wants to garden should have a place to do so. Michelle is the director of administration for MPN Research Foundation, which funds research into a group of rare blood cancers. In 2010 she received her Masters in Public Administration with a focus on non-profit management from Roosevelt University. Michelle's professional experience includes administration and management within the non-profit sector, and customer service and sales in the insurance industry. Michelle has been gardening full force since 2008 after she bought a house with her partner on a particularly sunny lot in Forest Park. She watched her mother and grandmother's successes growing all manner of vegetables and flowers and wanted to see whether she could turn her all-grass backyard into something a little more useful and maybe a bit special. A high point was turning over and tilling the yard herself and later leading in the construction of a couple raised beds. Favorites include basil, oregano, cherry tomatoes, and strawberry popcorn. Poppies are proving to be a challenge but she intends to persevere.